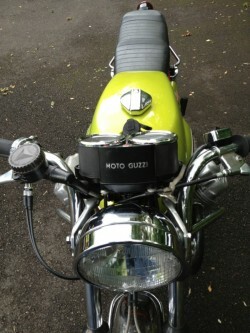 Prior to 1969, Moto Guzzi was known for its sporting singles. 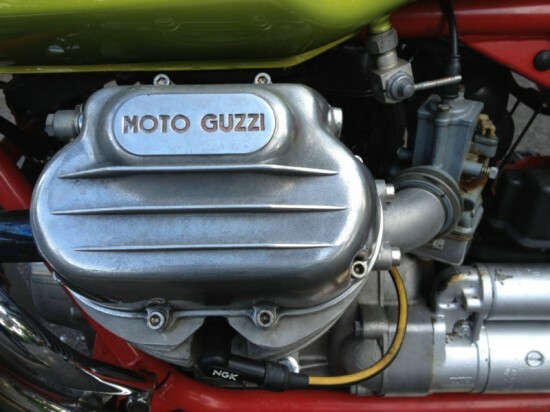 In the mid 60’s, Guzzi entered a competition sponsored by the Italian government to find a new police bike and Guzzi’s entry was motivated by a shaft-drive, longitudinally-mounted, air-cooled, pushrod V-twin displacing 700cc’s and producing 45hp. The powertrain had famously been used in a three-wheeled military tractor prior to this but, whatever the provenance, the set-up worked well as a durable, simple to maintain motive force for a police motorcycle: the powertrain proved to be reliable and Guzzi won the contract. It proved so fundamentally reliable that it has been in continual development ever since and the spiritual successor of that three-wheeled tractor motivates the current range of Guzzi models. In spite of the racing pedigree of the earlier single cylinder bikes, the “loop-framed” V700’s had more of a touring character. 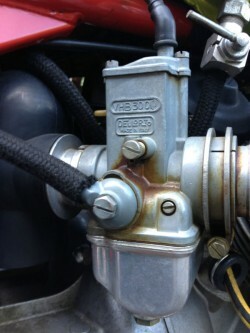 When Guzzi was looking to go racing with their V-twin, they needed a stiffer, more sporting frame to cradle their motor. Lino Tonti came up with a frame that gave the racing machine a very low center of gravity. It featured detachable lower frame tubes to ease in maintenance and the removal of the powerplant. The resulting V7 Sport was wonderfully low, exceedingly rare, and shockingly green. The bike was reasonably successful in racing, but was almost impossibly long-lived in the showroom, with derivatives of that frame still being used in the recent Breva and California. 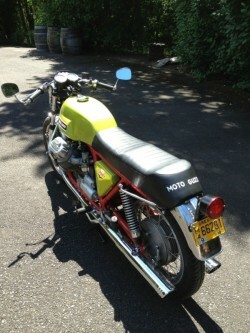 The V7 Sport for sale and shown here appears very original, with only limited changes and updates, including a switch to the later twin-disc brake set up. The seller mentions he still has all the parts to convert back to the original 4-leading shoe drum. 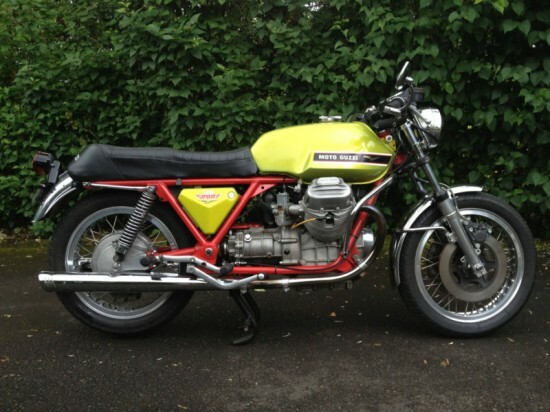 To see the original eBay listing, head here: 1972 Moto Guzzi V7 Sport for Sale. Original black “splatter” paint on the forks crown. Not repainted. Several extra small parts, and a few historic and coffee table Moto Guzzi books including Dave Richardson’s Guzziology tome. The seller mentions that, while the frame is painted red, “do not get your hopes up as I doubt this is a ‘Telaio-Rosso’ factory race bike.” For those not in the know, the first 160 or so bikes were known as the Teliao Rosso [red frame] bikes and had higher-spec components and sand-cast engine parts, similar in concept to the Serie Oro MV Agusta bikes. They’re perhaps the holy grail of collectable Guzzis. The bike looks like a great find, but V7 Sport is a very easy bike to fake, with the frames in production for many years and replacement tanks, seats, and other bits relatively easy to source. Do your homework and make sure any bike you’re looking at is the real deal before you click on that that bright, shiny PLACE BID button. 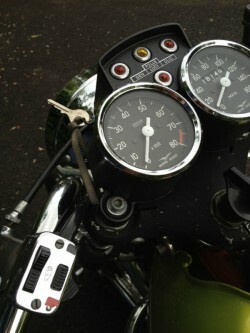 Just a note about the birth of the Guzzi V-twin. It was never used on a “military tractor” or any other device. It was designed by Julio Cesara Carcano, the same Carcano who designed Guzzi’s famous and exotic V8 racing engine, and it was designed from the very beginning as a motorcycle engine.